Or Low APR Finance at per month? Spread the cost of your purchase with a low rate 9.9% APR over 12 to 48 months. Figures provided are for illustrative purposes only. 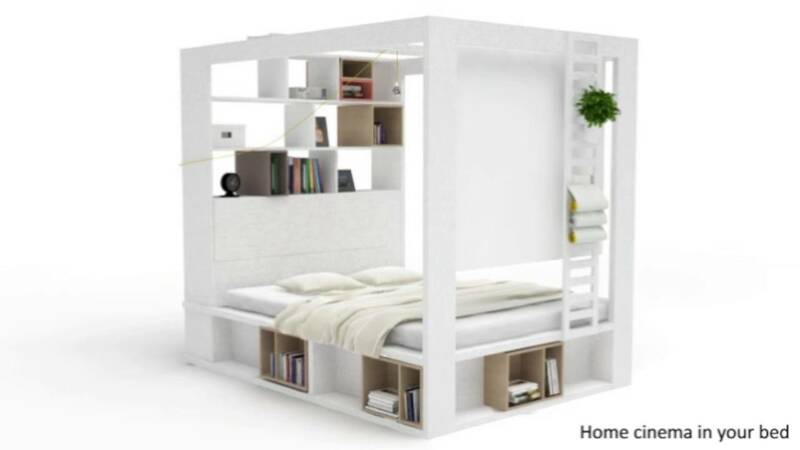 Is this the ultimate space-saving storage bed on the market? We think it just might be! This unique 4 Poster King-size Bed with Storage from the 4You collection by Vox is perfect for rooms where space is short, but you don't want to compromise on style. With an enclosed storage space behind the headboard and a shelving unit/bookshelf above, this bed has the perfect place to store and display books, decor or your alarm clock... eliminate the need for bedside cabinets! When combined with the raised mattress floor option, the mattress can be lifted up for access to even more storage underneath - perfect for hiding away spare bedding and pillows. This unique, luxury king size bed is perfect for kids, teens and adults alike, and is a great addition to a neutral, Scandi-style bedroom. Leave as it is for simple, contemporary style, or accessorise with canopies, curtains, fairy lights, funky mobiles - whatever takes your (or their!) fancy. A Side Ladder, perfect for hanging plants, organisers or clothing, is also available to purchase separately. Vox have created this unique furniture range to meet the needs of every consumer - it's time to embrace stylish, functional furniture, designed 4You!